“Prado’s Grapes” tells the story of the Willow Grange estate and its historic connections. The house next door, Gifford Lodge, has also left its mark. In 2005 the campaign to save the Gifford House site from becoming a high-rise block towering over Twickenham Green was organised by the Gifford House Action Group, composed of local residents and members of all societies and groups in the area. Assisted by Planning Aid for London the Gifford House campaign was said by officers at the Council to be the most successful campaign by residents in the borough. The developers were sent packing and a Planning Brief prepared by local residents from Strawberry Hill and Twickenham Green was sent to new developers by the Council; today the building overlooks Twickenham Green where the original Gifford Lodge once stood, its design echoing the past. We recorded history of the original house in the Planning Brief as follows: The land occupied by Gifford House was previously the garden of a handsome Twickenham mansion; recorded origins date back to the seventeenth century. The appearance of the house was celebrated in the engraving by Thomas Boydell in 1753. 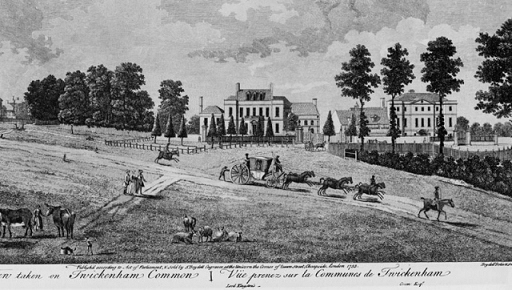 It is shown (on the left) standing next to its neighbour Twickenham Grange facing Twickenham Common. Its illustrious former owners over the centuries include the first Earl of Strafford, who negotiated the Treaty of Utrecht which ceded Gibraltar to Britain, Lady Eleanor Holles who founded the famous school for girls, Sir Chaloner Ogle, Admiral of the Fleet and Ruler of the King’s Navy and Dorothea Jordan, the famous actress and mistress of the Duke of Clarence, later William IV. The house was acquired by the Council under wartime powers as a day nursery. By 1963 it was occupied by squatters, caught fire and was demolished. A new building, Gifford House, was a residential care home until 2004. After its closure it became a temporary library and then a home to squatters. In 2013 Gifford Lodge, as it became known once again, was opened by Vincent Cable MP; the building comprises of 29 retirement apartments and closely resembles the original Gifford Lodge as recorded by Thomas Boydell. Thus, the view over Twickenham Green and from Strawberry Hill has been preserved while so many of our historic houses are now just street names. Local Area, Prado's Grapes, Pope's Legacy, Walpole's Strawberry Hill House, Grand Neighbours - Richmond House.